Lucy is a customer who called last year after finding the Pure Joy Bakery website. She ordered a gluten-free Carrot Cake for her birthday and wanted to make sure it wouldn't be too sweet. She sees a holistic practitioner in SF and she was glad to be able to report to them that she'd found a healthy cake. 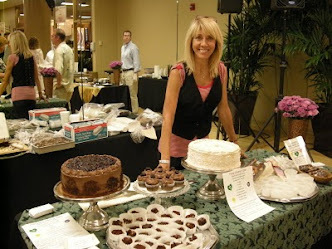 A couple of weeks ago, one of her gfs called to order Gluten-free Carrot Cake "Petit Fours" for Lucy's baby shower. I suggested bite-size cupcakes instead because they look so great with the frosting all swirled - and you can see them above. I shot the photo so close that I don't know if you can tell they are bite-size, but I made an army of them, row after row. Her gf also wanted to order cookies, so I suggested that I call Lucy and double-check flavors with her (Double Chocolate? Orange Almond? Ginger?). It turned out that Lucy said she missed Chocolate Chip Cookies most of all, so I made a batch of Gluten-free Chocolate Chip Cookies, sweetened with agave. I used a blend of "flours": almond, brown rice, potato starch & tapioca. VERY yummy! And so different from the "early days" in 1998 when I first started gluten-free baking when Elaine Monarch of the Celiac Disease Foundation asked me to begin gluten-free baking in Los Angeles....back then, the choices were garbanzo bean "flour", or brown rice flour - and the bean flour had an abominable flavor; the brown rice flour was a bit better but had a gritty, sandy texture that really "showed up" in cookies....not as much in Carrot Cake, though. These were SO delicious, especially for (healthy!) gluten-free cookies - I knew her friends would enjoy them, even though they were not gluten-free, vegan, and sugar-conscious. I thought these were so good that I suggested them to Jenn, the cafe manager at ClubSport San Ramon. She ordered them and I delivered the first order yesterday. I HOPE customers discover them - it's so different for me up here in Northern California. I became accustomed to people seeking out any new bakery item of mine at the stores that carried them in So Cal - or I introduced them at my booth at the Sunday Hollywood Farmers Market, sampling them out to the regular crowd and getting feedback and input from them, too.